If you love the fresh air and freedom of camping, but hate sleeping on the cold hard ground, check out our luxury glamping tent options at Holly Shores Resort! (Glamping is short for glamour camping, how cool is that!) We have 4 campground sites available with glamping tent rentals available spring, summer and fall! Each 16′ x 20′ canvas glamping tent is equipped with a king sized bed, 2 twin beds, a small refrigerator, coffee maker, microwave and half bath (showers can be taken in our bath house). Outside you will find a beautiful 8 foot covered deck with Adirondack chairs, a charcoal grill, picnic table and fire ring for fun evenings around the campfire. Each tent is equipped with A/C and heat, so you will stay comfortable in all types of weather. 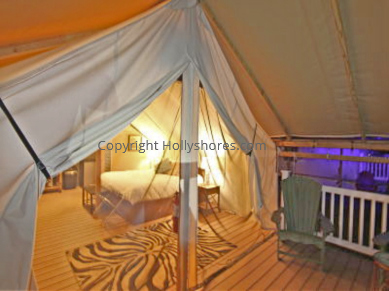 Our Holly Shores glamping tents sleep up to 4 campers, so this is a great option for a group or couples getaway weekend in Cape May, NJ. 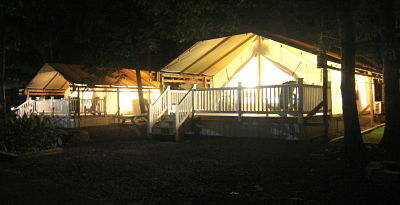 Check out or special Girls Glamping Getaway or Romantic Safari Glamping Getaway camping specials! Nothing beats waking up to the happy chirps of little birdies in the morning. Our glamping tents offer all natural beauty of tent camping with the comfort of a plush bed, indoor plumbing and electricity. Because we want to ensure everyone’s comfort and safety, smoking and pets are not allowed in our glamping tents. However, we do allow pets in many of our other cabins, cottages and RV campsites. 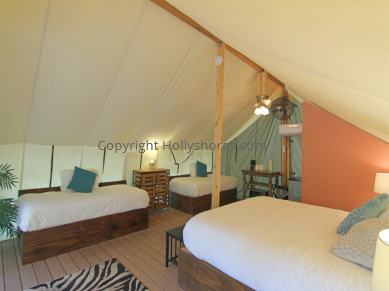 Our safari tents put the GLAMP in glamping! 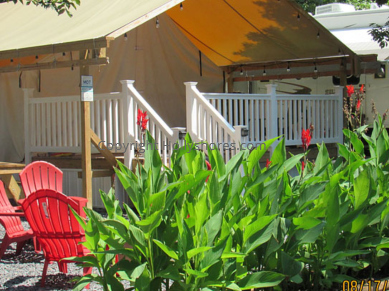 Book your glamping tent reservation online or call our booking office to reserve your spot today!